These past few days, the weather is so gloomy that you just want to curl up in bed or chill inside the house. But even though we're experiencing bed weather, we don’t always have the luxury of letting it get the best of us. So, we get up—albeit begrudgingly—and do whatever we have to do to get through the gloomy day, be it taking a nice cold shower, listening to upbeat music or drinking coffee. Coffee has always been there for those who want to stay focused and motivated despite the rains. We can choose to get a brewed coffee, whip up some instant coffee, or buy the cold ready-to-drink coffee at the nearest store. For students trying to get through an all-nighter and those who in a hurry to get to the office, the bottled coffee lattes are the best option, not only because it saves you the time of preparing a coffee, but also because it satisfies that thirst for a refreshing and recharging beverage. These bottled coffee lattes not only serve as a refreshment but also help give you get the much-needed boost you need during afternoons when you need to finish your tasks whether in school or at work on a lazy gloomy day. Bottled coffee lattes answer the Filipinos’ need for a ready-to-drink cold beverage that can liven up their day. Whether you’re a student trying to focus for a presentation the next day or a professional working that dreaded night shift, a bottle of coffee latte will definitely help you get the job done so you can recharge and stay focused on your tasks. The best part is, it’s available in your nearest convenience store which are open 24/7. And so, no matter what time of the day it is, if ever you need that extra boost, the cold bottled coffee latte is the drink for you. 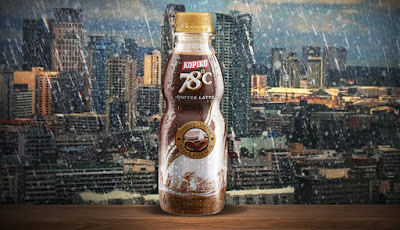 But with so many bottled coffee products already available in the stores, choose the coffee extracted at the optimum temperature to give you the rich taste and tempting aroma– the Kopiko 78°c. Best served chilled, Kopiko 78°c is perfect for starting the day, getting through siesta time, and even when you need to pull off an all-nighter. Remember that just like any other beverage and any other thing, too much is bad so take Kopiko 78°c in moderation. It also gives you the unique on-the-go coffee experience that helps you recharge during the day wherever you are.